Built in 1911, St. John's Rectory was the first location in Jackson Hole to hold regular Episcopal services. In addition to Sunday services, the Rectory was used as a meeting place and social hall as well as a hostel so that ranchers and lodgers at dude ranches more than a day's travel away could stay overnight. Through the years, St. John's Rectory was used as a community library, accommodated primary classes when the population in the valley began to grow, and established the first hospital in the valley, St. John's Hospital, which is now St. John's Medical Center. Butch and Ed Robinson of Jackson built St. John's Chapel in 1916 using logs cut and cured by George and Clarence Blain, with finish work by master carpenter Raul A. Imeson. The Chapel and Rectory were designed using the locally prevailing rustic style that was becoming popular for dude ranches and park structures. The church measures approximately 60 feet (18 m) by 24 feet (7.3 m), covered with an open log-trussed roof. 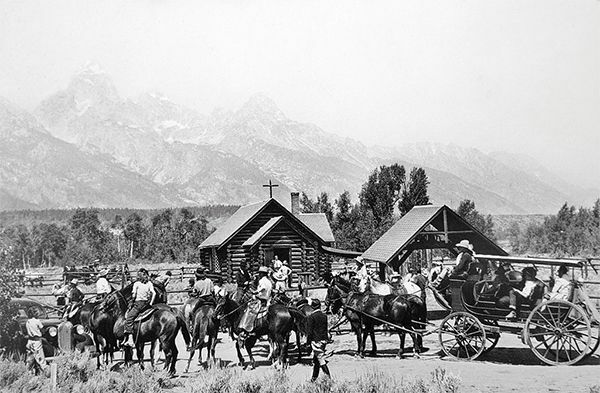 The chapel was built to serve guests and employees of the dude ranches that stretched north of Jackson along the base of the Teton Range. The land was donated by Maud Noble, owner of nearby Menor's Ferry, predating the establishment of Grand Teton National Park in 1929 and its expansion into the Moose area in 1950. Construction materials, labor, and local ranchers provided funds. The chapel was placed on the National Register of Historic Places on April 10, 1980 and still holds regular Sunday Services. When Pope Gregory sent St. Augustine as a missionary to England in the year 597 AD, Augustine was astounded to find a fully developed Christian Church already there. Called “The Celtic Church”, this branch of Christianity had functioned for hundreds of years with no contact with Rome. (Sts. Patrick and Columba were famous members of this non-Roman Church.) Legend says that St. Joseph of Arimathea who built the first Christian Church on earth in Glastonbury, England established this non-Roman Church in the first century. Celtic Bishops attended the Council of Nicea in 325 AD. In any case, the Church of England is practically as old as Christianity. In the 16th Century, the English Church hierarchy supported Henry VIII's political declaration that the Pope had no more jurisdiction in England. The “English Reformation” was at its outset a purely political move. The same clergy and the same Churches simply continued as they had before, but without jurisdiction by the Pope. The Church of England did NOT undertake theological changes, as did the Continental Reformers. She continued with the same clergy, the same Sacraments, the same teachings as she always had. During the history of the Church of England, there were high times and low times, with on-going theological debate and ritualistic struggles. At one point – during the rule of Bloody Mary (Henry's oldest daughter) – England returned for a brief time under the control of the Pope. At another time – during the non-monarchial rule of the Calvinist Protestant Oliver Cromwell – the Church of England's rites were actually outlawed in England. Nevertheless, through it all, the ancient and Catholic Church of England managed to survive and today, our Episcopal Church represents the American branch of that ancient Church. Unlike the Protestant Churches, our origins are not found in the 16th Century, but in the midst of the earliest centuries of Christianity. Hence, we are a Catholic Church in that we teach and practice the primitive Christian religion without the human additions of later years and we are a Reformed Church in that we reject the later additions made by the Roman Catholic Church (such as the doctrine of the infallibility of the Pope). All men of the parish are invited to join together for discussion, fellowship and breakfast. Join us for the Stripping of Altar service with foot washing. Those who wish to participate may come forward to have their feet washed. Zen Master Thich Nhat Hanh is a global spiritual leader, poet and peace activist, revered throughout the world for his powerful teachings and bestselling writings on mindfulness and peace. His key teaching is that, through mindfulness, we can learn to live happily in the present moment—the only way to truly develop peace, both in one’s self and in the world. Join us for the Adoration of Cross service celebrated the Friday before Easter Day, on which we commemorate the crucifixion of Jesus. Join us for a sunrise service at the Chapel of the Transfiguration in the shadow of the majestic Teton Range. For more information and the full Holy Week schedule, see our Worship page.